Are you going to visit Furano this summer? Wondering yourself what to do except viewing the colorful flower gardens? You will be glad to find out our top summer activities that you can gladly experience in Furano. Although flower viewing is said to be one of the best things to do here, yet you have a good checklist to make your summer vacation absolutely awesome. If you follow this checklist, I am sure that a trip to Furano during summer would exceed your expectation. A typical flower field of Furano during summer. Photo Credit: Chi King at Flickr. This small town has been offering impressive flower fields for almost 60 years and has built up a great reputation for exciting outdoor summer activities, food, accommodations, dairy products and wine. If you take a day trip from Sapporo, I am sorry but to tell you that you are going to miss something precious. Make a travel plan for at least 2 days and a night which includes sightseeing and hands-on-activities to get the taste of all the things explained below. Farm Tomita’s flower garden. Photo Credit: Kevin Jaako at Flickr. Flowering viewing is your top reason to visit Furano in the summer. Don’t you think so? Coming to Furano during summer is almost like visiting another planet! Hokkaido’s summer is short, but you have got to visit many places around to admire the flowers that bloom strongly and beautifully. Enjoy a great outdoor beauty viewing lavender, poppies, marigold, scarlet sage, lilies, sunflowers, and many more. Anyone can take a stroll on the rolling hills of floral wonder! Can’t wait to see? I highly recommend you to experience our top 10 most beautiful flower farms in Furano and Biei. They can be accessed easily from one flower farm to another. Before you arrive in Furano town, make sure you read this article to make your journey a great adventure. Let’s go for a bicycle ride! It will be an awesome idea to embark on a cycling tour from Furano to Biei. Anyway, what is the best time to cycle in Furano and Biei? The answer is defiantly summer! Both Furano and Biei are peaceful towns located in central Hokkaido, mostly famed for its picturesque landscape, farmland, flower fields and organic foods. The area’s gently rolling hills are pretty eye-catching! I believe adventure lies around every bend! If you know how to ride a bicycle then why don’t you rent one and enjoy the beautiful surroundings out there? Perhaps it will be a once in a lifetime experience for you. Won’t it be? The summer weather in the area is good so are the roads. In Furano and Biei, you can visit most of the top sightseeing attractions through cycling. Wonderful nature vistas, roads, and rental shops in the town make it possible for everyone to discover the hidden charms. Check out these guys who offer guided cycling tour. In addition, find a list of some recommended bicycle rental shops. Tomita Melon House. Photo Credit: tomita-m.co.jp. If you are a big fan of soft-serve ice cream, fruits, sweets, and buns head to Tomita Melon House. You will be overjoyed! Please note it is only a few minute walk from Farm Tomita. The place is arguably one of the best when it comes to refreshing your mind and soul after spending some times at Farm Tomita. Furano melon production has a big impact on Hokkaido’s economy and it is hugely famous for growing a large number of sweetest melons (Yubari King Melon) in Japan. Eat some fresh sliced yubari king melons and feel the taste of it! Besides, you would find a list of mouthwatering foods such as baked melon bread, melon ice cream, melon cakes, melon dirnks, melon tarts and many more. Tomita Melon House operates its business only during the flower viewing months, from early June to late September. Alternatively, to taste Furano melon, you can visit Popura Farm. Participants have to wear colorful attire! Photo Credit: Kevin Jaako at Flickr. 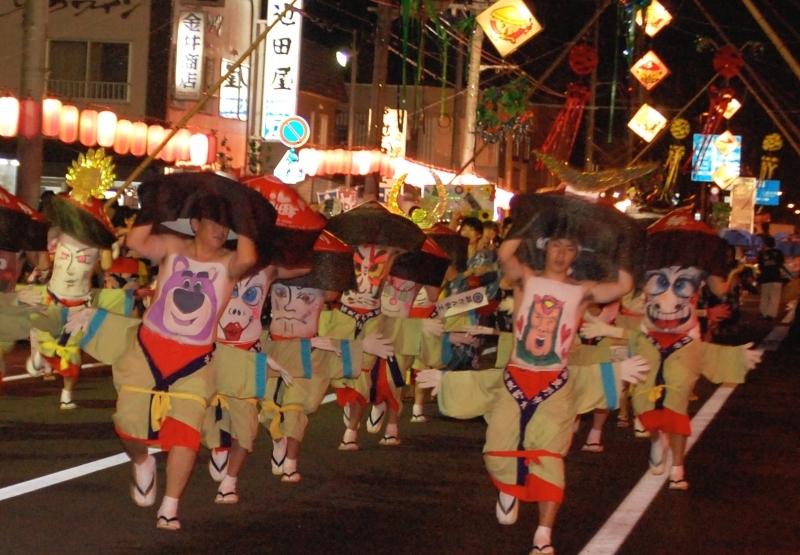 Japanese summer can’t go away without entertaining locals with a particular matsuri/festival. Locals of Furano eagerly wait for an annual summer festival known as Furano Bellybutton Festival. Being the biggest summer festival in the area, it is celebrated for two days in a row leaving the visitors speechless. Although it is a traditional dance festival, yet you will be overwhelmed by the way the participants perform it. They follow a unique style dance that look stunningly gorgeous. The main highlight of the festival is the stomach-art dance performed by thousands participants. Painting a face on a stomach is an art, and every participant must draw their stomachs with wearing proper attires. While dancing in the parade they must hide their arms and faces under a straw hat. If you want to be a dancer, please contact them earlier before festival begins. Find more info here. Certainly this is one of the best things you could experience in Furano in summer. Don’t miss this crazy dance event if you are supposed to visit Furano in late July. 5) Furano Jam Garden – Jam Making and More! Rokugou viewing platform! Photo Credit: furanojam.com. If you think that this place is all about tasting variety of Jams, then you are totally wrong! I admit you can taste them all, but aside from doing it you can try yourself making some jam. With a little fee, they offer visitor a great jam making class that is held twice in a day. Besides, Furano Jam Garden is lovely place for your little ones especially if they like the cartoon character Anpanman. There is a building called Anpanman Shop where you can find tons of awesome Anpanman merchandise. When you go to Furano Jam Garden, make sure you don’t forget to pay a visit to Rokugou viewing platform. During the lavender season, the area looks pretty awe-inspiring! The surrounding beautiful flower fields and magnificent view of the mountain range in the background would overwhelm you for sure. It takes about a-30 minute drive from the JR Furano station. Address: 3 Higashirokugo, Furano 076-0162, Hokkaido. 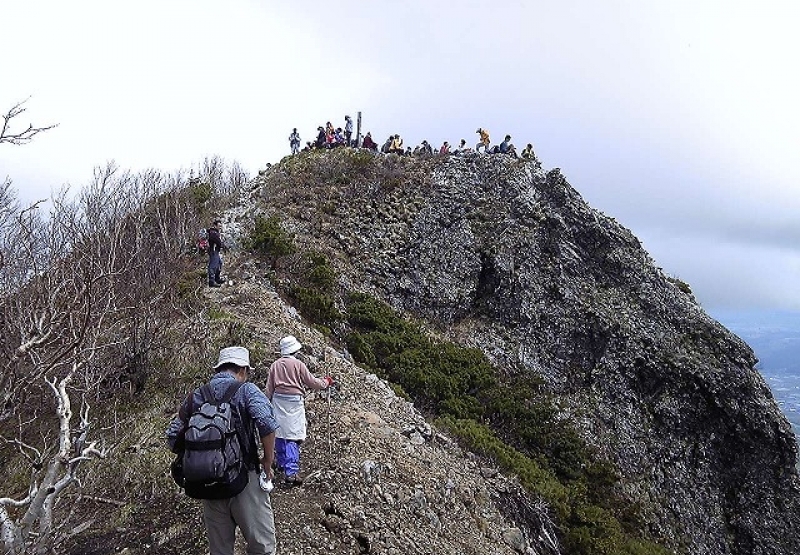 Hikers at the top of the Mount Furano-Nishi. Photo Credit: furanotourism.com. Both hiking and trekking are done as part of recreational activity. Apart from visiting flower fields and eating local delicacies one should also consider having fun with hiking/trekking. In Hokkaido, there is endless opportunity for adventurers who want to explore the hilly or mountainous areas of fabulous natural beauty. The surrounding areas of Furano town are hilly and provide various hiking trails to enjoy a great outdoor activity. In winter, trails are not possible to go for hiking due to heavy snowfall, but in the summer snow disappear completely and make it possible for you to hike safely. I would highly recommend you to climb the Mount Furano-Nishi. You have to walk along the designated trails to reach to the top of the summit which would let you enjoy outstanding panoramic views of the Furano valley and Tokachidake Mountain range. If you don’t want to hike up the mountain all the way, take the Furano ropeway (gondola). The hiking season here begins in late June through mid October. Awesome rafting experience in Furano! Photo Credit: Furano Tourism Association. Furano is a paradise for outdoor adventure lovers. Rafting on the Sorachi River would be a hilarious outdoor experience, and through this summer activity you are offered to admire the stunning nature scenery that lies along the Sorachi River. The Sportia Furano offers three types of rafting tours for all ages. The helpful and skilled crews of Sportia Furano lead the journey towards an unbelievable adventure with a lot of excitement along the way to the end. A rafting experience in Furano is full of fun, exciting, and most importantly you are on the way to endless discoveries. You must experience one of their rafting tours to complete a great summer trip to Furano. Don’t just leave the town viewing lavender and other flowers; instead make a rafting tour reservation as soon as possible. Please visit this page for more info about departure place, fees, time, access, and more. Impressive lavender garden of Highland Furano Hotel. Photo Credit: Furanotourism.com. Are you thinking about what this might be? This is a small hotel with onsen (hot springs) facility that features a lovely lavender field in front of it. Highland Furano is one of the best hotels in Furano, where you should think about making a reservation. The early the better! From the beginning of July lavender start blooming here and you can see the magnificent lavender field directly in front of the open-air bath. How cool is that! In addition, except staying in the hotel and relaxing in one of the hot spring baths, you may think of roaming around the hotel area. Seriously, it will be a peaceful walk of wondering the Furano’s traditional landscape. The hotel is located not that much far away from JR Furano Station; and from there it takes about 10 minutes by car! Furano-Biei Norokko-go Train. Photo Credit: Wikimedia Commons. I love traveling by train! Here, I will not suggest you to enjoy a ride on this special train from Asahikawa to Furano! Instead I would like you to hop on the train at the JR Furano station and enjoy a scenic train ride all the way to Biei Station. The surrounding areas you will be witnessing through the wide windows of the train’s car are just incredible! The Furano-Biei Norokko-go train is not a shinkansen, so don’t expect for a quick ride. It runs at a leisurely speed as a result tourists can enjoy the surrounding spectacular landscapes along the Furano Line. Please bear in mind that the train operates only in summer during the lavender season. The idea of operating this special train is for easy access to most of the popular flower farms in Furano and Biei. Whether you have a Japan Rail Pass/Hokkaido Rail Pass or not, you should always enjoy a ride on this train. Those who have already purchased JR pass don’t need to buy a ticket. Please find more info here. The rolling rainbow fields of Shikisai no Oka! Photo Credit: field-north.com. I know it is located in Biei. It is a small town adjacent to Furano. If you ever take a trip to Furano, manage some times for visiting Shikisai no Oka – one of the scenic places and popular flower farms in central Hokkaido. In the entire Furano and Biei area, the garden is said to be one of the largest flower gardens of all. You will not find a place similar to this elsewhere in the Hokkaido region! If you are looking for something awesome such as the colorful rolling rainbow fields in Furano, head towards this panoramic flower garden. It features rows of beautiful flowers of different kinds. Upon arrival of summer, the gently rolling hills of the garden get covered with tons of flowers. The one who is fond of landscape photography he/she must visit this gorgeous place. In fact, Shikisai no Oka makes a great place for pre-weeding photoshoot. 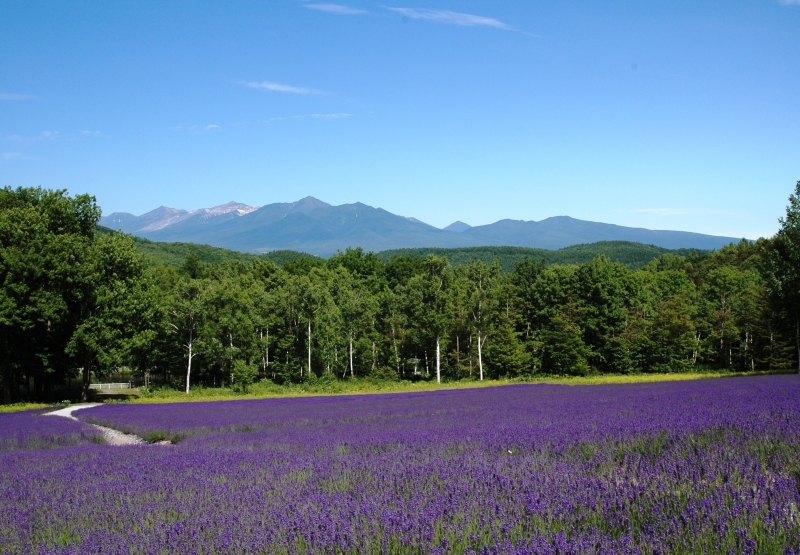 Tourists in furano desire to see brilliant display of colorful scenery in the summer. That’s their ultimate goal, but except this Furano has so much to do and see. Honestly, here you just discovered some ideas! There are more to explore beyond all these things. Thanks for reading!